Though we live very close to the ocean, I often forget to visit it frequently, or just how abundant of a resource it can be for us. This morning, I rose at 5:15 AM and fixed a very light, quick breakfast so I could leave for the beach. 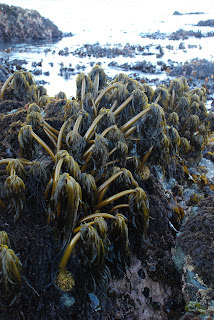 Last night's full moon brought a -2.1 foot low tide this morning, and right now is high seaweed season. 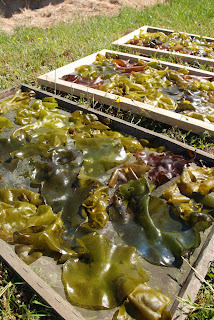 Our seaweed stash is rather low, since Drew and I haven't made the half-hour trek south of the Mattole mouth to collect it since before Ella was born. It was a lovely, if cold morning. Being a parent of a late-sleeping child, I rarely see the pre-sunrise day in all it's shape-shifting glory. The birds' morning chorus was in full effect, a sweet cacophony of melodic tunes overlapping. This birdsong is made even sweeter by the fact that it is so short-lived. We will really only be graced by it for another month or so. The moon was hanging low in the western sky as I drove away. I stopped to photograph the Mattole River as I crossed the Hideaway bridge. There was mist hanging around, the greens of the riparian forest were so vibrant, and the river was reflecting the sky. The swainson's thrushes were singing in the brush by the parking lot, and I hoisted my empty pack and headed south. What a treat a solo walk in the early morning by the ocean is! It's probably a mile to the third collection of rocks, that jut out from the continent into the Pacific ocean. This spot stretches out the furthest into the sea. On my approach, I startled a family of sea lions, who were relaxing on the rocks. I imagine they would have been long gone had I been with someone else and talking. I timed my arrival perfectly. I made it out to my farthest reach just as the tide began to shift. I was surprised that the turning was such a palpable feeling, but I was way out from shore, and everything was calm and still, pulling away, quieting, and then suddenly, it wasn't anymore. The swell seemed a little more urgent, and the waves began pressing inward again. 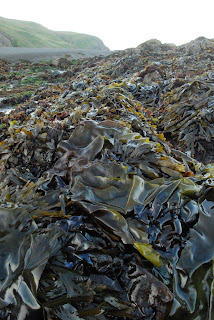 Time to begin my return, picking carefully over the very slippery rocks, collecting various kinds of seaweed as I go: wakame, iridescent seaweed, and unidentified green seaweed, sea lettuce, and so on. I tried to remember what nori looks like, but embarassingly, I couldn't remember. 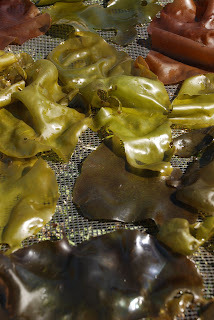 I think it's been four years since I last collected seaweed! 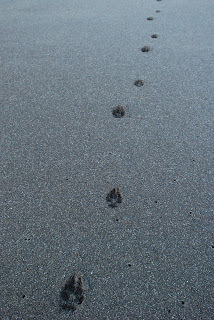 On my way home, I practiced some tracking in the sand and low light conditions. On my way out, I had noticed one and then two trotting tracks of coyote that basically stretched the entire way out to my destination, and continued on. 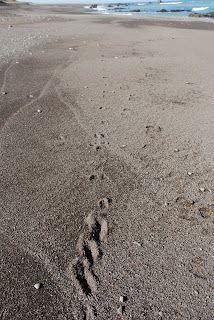 They were fresh, having been laid while the tide was on its way out, evidenced by the erasure of a few of them. I caught this image of the animal clearly stopping to look over its left shoulder behind itself. I've always wondered how you would see that in tracks, but here is a clear example. 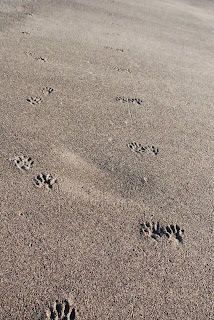 I also followed a series of raccoon tracks, one and then two (and then one again) trails winding their way through the sand. 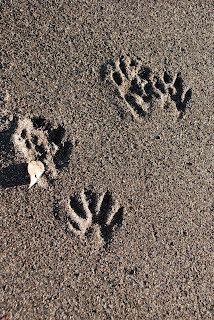 They were perfect raccoon tracks, and I photographed a sequence of the four feet, as well as its trail, which looks like two feet side-by-side, but is actually left hind next to right front, and the opposite. They seemed to like to travel along the surf line where there is a lot of debris. Presumably, they were looking for a tasty morsel. What an amazing entry. I love reading your blog and seeing the images of your life near the Pacific. I also got your sweet message, thanks. I have been so busy in the garden that I haven't checked my email in a million years. Thank you for your support and your lovely comments. Since I don't have to get radiation I am reclaiming my summer life, in more ways than one. I want to sit down and catch up on your blog, it is supposed to rain again tomorrow so I will be inside. You know how it is, when the weather is good the garden and the animals call. I too think of you. Your blog so inspires me. I love to check in with my favorite blogs, to communicate with friends over the net in the wee hours. I love to read other cyber journals too. So YES, I love the idea of being your days-of-old pen pal. I was a child of the 70's and always loved having and being a pen pal. I was born in '63 and still feel like 17, life is good.